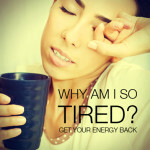 Could it be that your thyroid is not getting adequate nutrition? 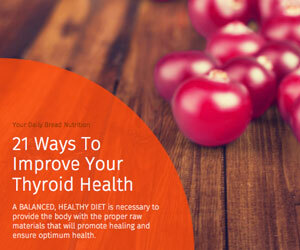 A BALANCED, HEALTHY DIET is necessary to provide the body with the proper raw materials that will promote healing and ensure optimum health of the thyroid gland. In addition to the recommendations below, it is so important to be tested by a holistic practitioner for iodine sufficiency. Iodine is the most critical trace mineral that will not only support your thyroid but every single cell in your body especially the reproductive organs! Minimizing the consumption of RAW cruciferous vegetables (some examples are brussel sprouts, cabbage, cauliflower, spinach, broccoli & kale) These veggies need to be lightly steamed or sautéed to destroy the thyroid inhibitors. Eliminating BROMIDES (bromide is also a halide and it competes for the same receptors that are used in the thyroid gland to capture iodine. This will inhibit thyroid hormone production resulting in a low thyroid state.) Some places you will find bromides are in soft drinks, baked goods, pesticides, and swimming pool/hot tub treatments. Eliminating all SOY foods (with the exception of SMALL amounts of fermented soy – miso, tempeh, and naturally fermented soy sauce) Soy is a hormone disrupter and also profoundly inhibits mineral absorption. Eliminating xenoestrogens in the form of household chemicals (nail polish & remover, cleaning products, dryer sheets & fabric softeners, etc), pesticides, plastics, chemical pesticides and fertilizers, conventionally raised animals, cosmetics and toiletries, plastics, household cleaners, unfiltered water, food dyes and preservatives. and many, many more. Eliminating sunscreen use – sunscreen has 4MBC & Benzohpenone 2 [BP2] which are very harmful to the thyroid. Instead use a healthy sunscreen, one of which may be purchased at Mercola.com or getting sunburned easily may also be a sign of essential fatty acid and calcium deficiency. Eating a healthy diet can be challenging. Much of the refined food is inexpensive and readily available. It may take some work to change your diet to include whole foods. Take it one step at a time and do not feel overwhelmed. Small improvements in your diet can result in significant improvements in your health and…YOU ARE WORTH IT! Download your complimentary eBook now on the various ways to improve your thyroid health. We respect your privacy, we do not share your contact info with third parties.